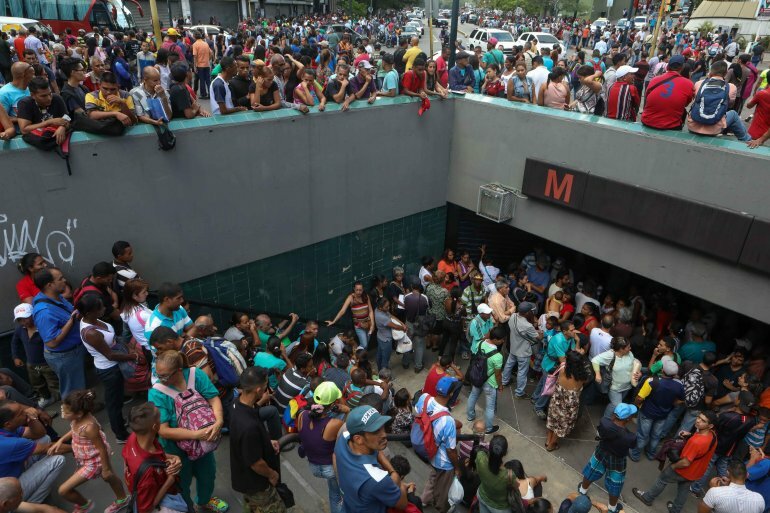 Venezuelan capital Caracas was hit by its second blackout in 24 hours on Thursday as authorities scrambled to restore transport and telecommunication services. Commuters resorted to walking alongside major roads after the city's subway system shut down while mobile phone networks collapsed, according to reports on social media. The power cut started around 11:25am local time and also affected parts of neighboring Vargas and Miranda states. 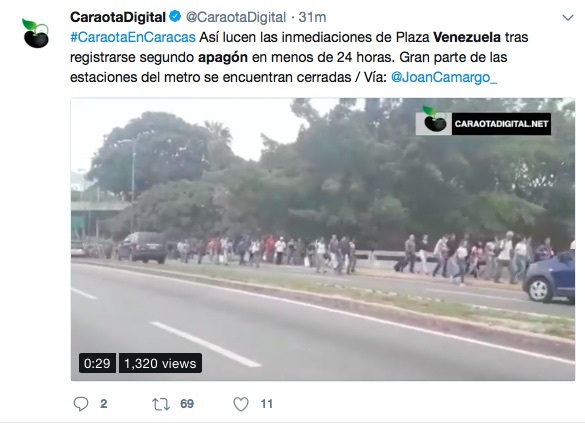 "Without electricity at our offices in Plaza Venezuela," Amnesty International's Venezuela director Marcos Gómez wrote on Twitter. "We don't have any hope of improvement due to the lack of transparency and accountability of authorities. We will simply hear their repetition of unusual and useless excuses," he added. Energy minister Luis Motta blamed the incident on a "sectioned cable," without forecasting when electricity would return. "Compatriots, due to the repair of a cable that was sectioned yesterday, services will be interrupted while work is undertaken. Circuits will then be gradually re-activated." Thursday's blackout followed an outage that left dozens of neighborhoods in the north of Caracas without electricity for around 40 minutes on Wednesday. Venezuelans have grown accustomed to power cuts as state-owned utility Corpoelec, which was nationalized in 2007, suffers from years of underinvestment and mismanagement. The oil-rich country is mired in a spiralling economic crisis marked by hyperinflation, rampant crime and acute shortages of food and medicines. According to independent media outlets, Caracas was hit by eight major electricity outages last year. President Nicolás Maduro has accused political opponents of conspiring to "sabotage" public services. In January he ordered the armed forces to protect power and telecommunications facilities from alleged attacks by paramilitaries and "terrorists."